As a Floridian of over 13 years now, I can honestly say that the secret to surviving any storm here is being prepared. Stocking up on canned foods, water, and other essentials is of course very important. Yet, when asked, I would have to say that the top hurricane essential for Floridians is a sense of humor. OK. Now before you start scrolling down to leave me a comment about how a hurricane is now laughing matter, let me explain a little. I mean no disrespect, nor am I trying to be inconsiderate to those who have lost their lives, their homes, or their cherished possessions through this storm. They have, and will continue to be in my prayers. In my own family, we are dealing with damage from the storm. And riding it out was extremely scary. I think I slept about a whole 20 minutes. It is with this in mind that I write this post as a means to lift spirits and to show the strength, resilience, and mostly, the humor of Floridians. We can handle a lot.. Yet one thing we do best is find humor in hurricane the size of our state. Scrolling through Facebook at 3:30 AM while the winds howled and my roof leaked was one way I rode out the storm. Being able to see some of the hilarious posts and images people were posting, as a means to stay sane, allowed me to the laugh when I wanted to cry. When Irma had finally passed over, it was time for clean up. We have a large front yard, which after the storm, was covered in tree debris. The house was also a mess with pots and pans, food debris (lol) and just a lot of stuff from being inside for about 24 hours straight. s rodeo, so my hubby and I choose to find some kind of fun in it. Something like this.. Riding out a hurricane isn’t easy. Some may even call you crazy. 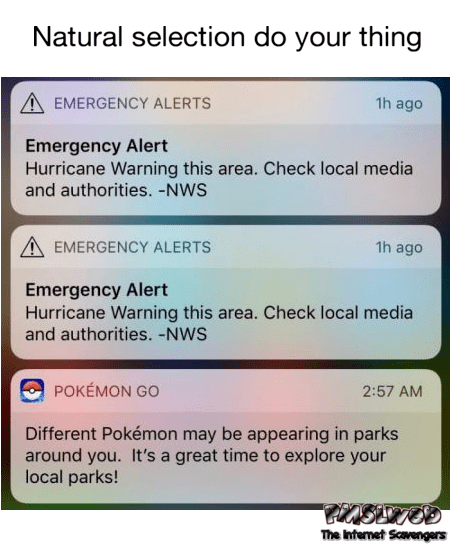 Yet, if you are prepared ahead of time and ready to face whatever may come your way, it’s just something you do… especially if you are a Floridian. You make sure you have plenty of gas for the generator, have plenty of canned goods to eat, water to flush the toilet, and plenty of snacks to eat during the storm. But most of all, you pack your sense of humor.. because you are definitely going to need it. Have you had to ride out any hurricanes or crazy storms? Leave me a comment and let me know what kind of things helped you get through it. Oh my, some of these are crazy! The wind surfing guy?! I do agree though, that humour can help during these struggling times. I know. I thought they wind surfing guy was hilarious too. Floridian’s are crazy like that. I think it helps to bring humor to stressful situations! It definitely does. Thanks for stopping by Deborah! that free tree sign is so funny! Ha ha. I know.. aren’t they hilarious Rebecca. Thanks for stopping by! Haha! Pokemon… that’s awesome. And those cakes! I know. I thought that was great too!! Yes it is!! And I know.. I laugh a lot, so maybe that’s why I don’t get sick too much either! Great point! Humor is some important especially is stressful situations. Love the “closed for remodeling” sign. Too funny!